Solitaire has been part of Windows since the earliest days, when there was little, if any, other software to run directly in the environment. Since then, one or two useful programs have appeared on the platform, but people still play Solitaire, a lot. If you like Solitaire, but want a variation or two... hundred... you should check out the freeware program PySolFC. PySolFC is a tremendous collection of Solitaire games, going well beyond the usual mix. In addition to traditional card games, there are Mah-Jongg tile matching games and Asian Hanfuda games. Within each category, there are sub categories, and sub-sub categories--for example, under French games, you may choose "Fan Type," and under "Fan Type," the specific game Cloverleaf. Unlike the original (no longer supported) Pysol, this one installs easily as a .exe, instead of relying on a pre-existing Python install. It's very plug-and-play. However, there are some drawbacks. First, those used to a lot of graphical flash and bang may be disappointed. While there are many, many, different face and back styles to choose from (but only two Mah-Jongg tile sets, a bit of a disappointment), there's little in the way of animation or other non-essential bells and whistles. The "Help" file is very sparse, and many of the games have no rules described--if you don't know how to play, say, the "Exiled Kings" variant of the "Beleaguered Castle" subtype, you're out of luck. On the plus side, PySolFC tracks your performance on all games, and includes several options to control play speed, mouse response, and other things--focusing on functionality over flash, always the sign of a good program. 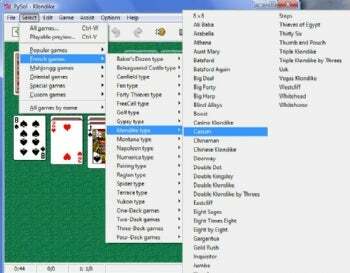 If you ever want to play any form of Solitaire beyond the variant included free in Windows, this free program is well worth downloading.